Engineers Without Borders University of Washington Student Chapter is a part of EWB USA. Founded in 2002 in Colorado, Engineers without Borders™ Organization (EWB-USA) is a registered non-profit 501(c)3. EWB-USA supports community-driven development programs worldwide by collaborating with local partners to design and implement sustainable engineering projects, while creating transformative experiences and responsible leaders. From 2006 until 2010, our chapter worked extensively in the Acasio region of Bolivia to improve communities’ roofs and stoves. 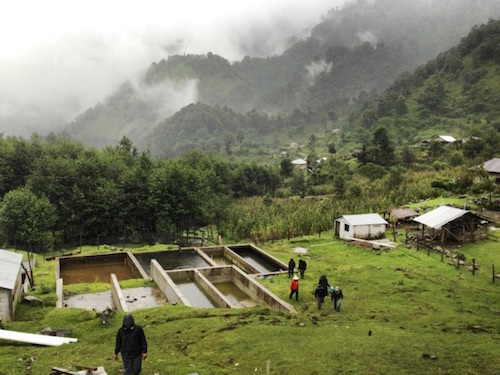 Since then, the chapter has begun work in the community of La Vega de Volcan in Guatemala on a trout hatchery, and other supplementary projects. La Vega de Volcan is a mountainous community in Northwestern Guatemala. In July of 2012, our chapter began a 5 year commitment to developing sustainable solutions identified by and in partnership with the community. Just years prior, a cooperative within the community had constructed a trout hatchery which was to serve as both a food and income source for La Vega, where many men have otherwise recently been forced to abandon their families, migrating to the U.S. or Mexico in search of work. Unfortunately, the hatchery was unable to experience success, hatching less than 2,000 eggs per year. During the 2012-2013 school year, our chapter redesigned the hatchery’s incubation system, rerouted much it’s piping, and screened the system’s inlet at its river source. The implementation of these designs occurred in September 2013. During the subsequent breeding season, the community was able to successfully hatch 25,000 eggs. Currently, the chapter is working with the community to construct a community center that will serve both as a market and a cultural epicenter. In January of 2015, representatives of our chapter once again traveled to La Vega and completed the first phase of the community center project. We continue to advise our friends in La Vega on their projects, supporting their development on their terms, and we’d love if you could join us. Photos by Sunni Wissmer.